I am delighted to announce the 2018 BJÖRLING MUSIC FESTIVAL. This year’s festival, held November 4-5, features the 30th annual Gustavus Honor Bands and the inaugural Honor Choir and Honor Orchestra.I sincerely hope you and your students will join us this fall! Our festival brings together 250 students from 60 high schools across Minnesota, Iowa, North Dakota, South Dakota, Illinois, and Wisconsin for two days of music. The event features faculty clinics, workshops for teachers, rehearsals, and a concert in Gustavus’ magnificent Christ Chapel. The honor ensembles will be under the direction of myself, Dr. Greg Aune, Dr. Brandon Dean, Dr. Heidi Johanna Miller, and Dr. Justin Knoepfel. The finale concert features the two honor bands, honor choir, and honor orchestra. High school students will also be treated to live concert performances of the Gustavus Wind Orchestra, Gustavus Choir, Gustavus Wind Symphony, and Choir of Christ Chapel. Students are selected following a nomination by their high school music teachers, private instructors, and conductors via an online nomination form (see URL below). Whether you have nominated students each year for decades, or you have not yet participated, I hope this year you will nominate all deserving students in your program. 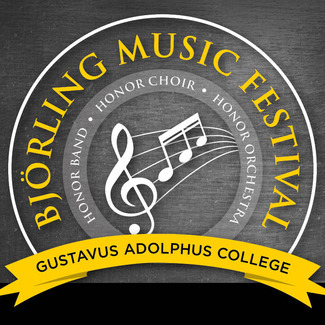 All nomination and registration information and forms, as well as many more details about the Björling Music Festival, are available online at gustavus.edu/ bjorlingmusicfestival. The participation fee is $30 per student. Nomination deadline is October 5. While nomination forms may be received after this date, space will be limited. The Björling Music Festival is a highlight each year, and this year will be a truly special event. We look forward to working with all of you and your students. If you have any questions please do not hesitate to contact me at jpmgwo@gustavus.edu.